Rediscover a younger, firmer-looking complexion with the NuFACE Mini in 'Petal Pink'. Combining a mini facial toning device with a gel primer, the kit will contribute to a smoother, lifted and younger-looking complexion with regular use. An innovative, portable device that utilises micro-current technology to help lift and re-contour the appearance of skin. Safe and effective, the natural, non-invasive facial lift solution is clinically proven to improve facial contour and skin tone, whilst contributing to the reduction of wrinkles across the jawline, cheeks and forehead. The rechargeable device is FDA cleared and easy to use at home or on-the-go; it delivers visible, long-lasting results with continued use, and is suitable for all skin types and ages. Travel-friendly. Complete this microcurrent treatment 5 days a week for 60 days. After 60 days, you can reduce to 3 days a week. 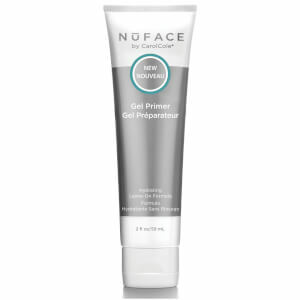 A lightweight primer that perfectly preps skin to receive your NuFACE toning device. The gel formula enables the device to glide effortlessly across the skin, while ensuring maximum microcurrent conductivity for optimum results. Suitable for all skin types, the formula is water-based and extremely easy to remove. Free from parabens, dye, salt and fragrance. PREP: Cleanse skin and apply NuFace primer. 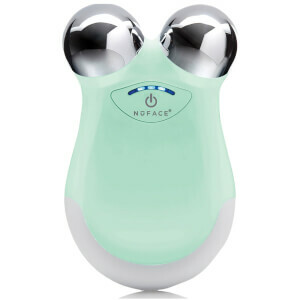 LIFT: Glide the NuFace mini device over face as directed. FINISH: Remove NuFace primer with a damp cloth. Primer: Water, 1, 2-Propanediol, Acrylic Acid Polymer, Caprylyl Glycol, Methylisothiazolinone, Cellulose Polymer.